I have read many books and field guides on wild foods and foraging from classics like Stalking the Wild Asparagus to botanical tomes. They taught me much, but inevitably left me wanting. They rarely covered the subjects in enough depth to feed my curiosity. I was growing tired of reading the same generalities. I needed some meat and potatoes details. Exactly how and when do you harvest the plant? What parts do you use? Exactly how are they prepared? It took me many years and many mistakes to learn how to become an efficient forager. If only I’d had a manual that could have answered all my questions and have given me foraging guidelines. Well, today’s beginner forager is much more fortunate. 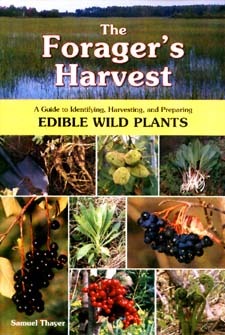 Now they have A Forager’s Harvest, probably the most comprehensive, well written work on the subject today. The author, Samuel Thayer explains everything in easy to read, clear language. His writing is full of good ideas, tips and shortcuts. It helps you get organized in the right way from the beginning. One of my concerns as a forager and particularly as a foraging teacher is knowing what is in season at any given time. Familiarity with the locations of plants and their seasons saves a lot of wasted time and effort. Sam Thayer simplifies the problem with a very clearly laid out chart, allowing you to plan ahead. Thayer doesn’t attempt to take on the world of edible species, but confines his writing to the more common plants with which he has had extensive experience. It is obvious in his descriptions of plants and their uses that he has really taken the time to know them and explore them in depth. Although I am very familiar with many plants he writes about, I always learn something when reading his accounts. The average guide will identify a plant, briefly discuss its edibility and medicinal properties and possibly include a recipe or two. The Foragers Harvest goes into great detail on where to find the plants, how and when to harvest them, what parts to use, what tools you may need for gathering, cleaning and preparing them, the best ways to prepare your harvest, how best to preserve it and what not to do. By the time you have finished reading about any plant, you feel that you really know it well, and can’t wait to get out their and try it for yourself. Although I highly recommend owning several books on the subject (including at least three field guides), this is one publication that is a must in every forager’s collection.